This is the largest temple complex in operation in Phlan and is dedicated to Tyr, the god of justice. Tyr’s worship is enjoying a great surge in popularity, as many see Phlan's rebuilding success as a sign that the god watches over them. The priesthood is headed by Father Dimble, a gnome of recent arrival, taking the position after the earlier and much beloved High Priest’s (Holondos Stimpiir) retirement. Bishop-Councilor Dirten Andorias, who is often here, is responsible for the outlands of Phlan. Three noble houses in Phlan are solidly supporting the Waiting: Houses Desanea, Summerset and Andorias. The Waiting has been rebuilt in 1380 after a violent raid by the Church of Bane destroyed most of its ground floor interior. Following what was called the ‘Temple Wars’ period, the Banites paid heavy fines and restitution to the Tyrran Church and with that, and generous donations from the flock and from recently arrived Triadic clergy, the cathedral looks starker, but almost as strong as before. The Waiting also operates a semi-secular school in the Western district, out of the Shrine of Torm. The Hammer of Tyr, its most holy relic, which disappeared after the latest razing of the city, has recently been found and returned to the Waiting by a group of adventurers whose identity is widely disputed and discussed amongst the faithful and through the city. Consecrated burial vaults along with an underground chapel also lie underneath the temple. 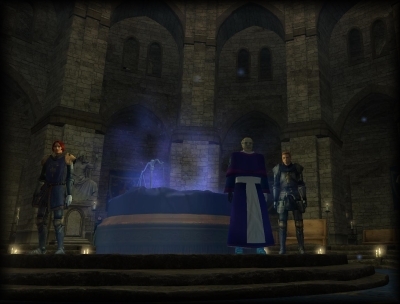 The burial vaults are available for the interment of any adventurer who dies in Tyr's service. The Waiting's exterior is composed of high walls, dotted with arrow slits and topped with machicolations ( they are also enchanted with verbal alarms to alert Tyrran clerics when the temple is under attack) and massive gates of ornately carved wood over thick plates of forge-hardened steel. Within is a vast courtyard that surrounds the main temple. The temple itself is a square utilitarian building of dark stone topped by a single gleaming bronze dome. The entrance of the temple is simpler than it was aftger the great fire, but the façade carved with friezes of a stern-faced Tyr dispensing either riches or jagged lightning bolts to petitioners kneeling before him survived relatively intact. The main hall itself is a great round room of gray stone under a gilded bronze dome. Dominating the room is the the altar itself, with the holy relics of the Silver Scales and the Hammer of Tyr resting atop it. On the floor, near the altar, is a green stone which can be depressed, causing the great dome above to split into seven sections that recede into the temple walls, leaving the hall open to the sky. Outside the main hall are stairs leading to the living quarters, armory, library and kitchens. A gnome from Impiltur, he arrived to Phlan with several others, sent by the leadership of the Church to strengthen the faithful, reeling after losses of the Temple Wars. He is an excellent administrator and a shrewd judge of character, but not a good preacher. The previous High Priest of Tyr is an aging man, above all a kind and good person, and he will always have a word of encouragement for those fighting for Justice or suffering from the lack of it. He is now retured and soending his time in the infirmary, lending his considerable skills to those who need it. The prototype of a warring priest, he spent most of his earlier years roaming the surroundings of Phlan with a small band of loyal clerics and adventurers and spreading the justice of Tyr, more often than not with his sword. While he is seen often in the Waiting, where he is technically second in the hierarchy, he now mostly is busy with his duties as a Councillor. It is said that despite their religious and political differences he is a good friend of Maxim Raegar, and they have been seen fighting side by side in more than one occasion.